This page describes a presentation that was given at the CELF Technical Jamboree #4, on September 30, 2005. Please see here for details. The original material was in Japanese, and has been translated. 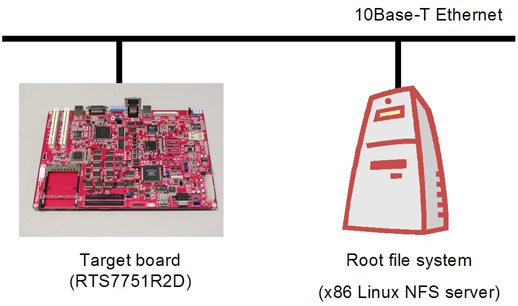 The presentation gives the results of testing the behavior of the O(1) scheduler. The tests consists of measuring the real-time thread response time. The thread library used was NPTL (Native POSIX Thread Library). English translation is not completed yet. Please refer to THIS material for your reference. create new virtual device entry in /proc file. 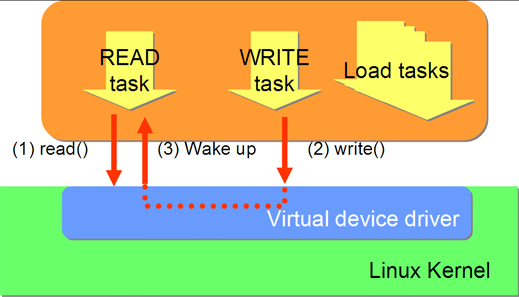 When "write to /proc" event occurs, create a new thread that blocks the same device file using "read"
Do "write" to virtual device file create a trigger for "read" task wakeup. Do "read" to virtual device file to block. Rival tasks those have same scheduling priority. Each "read" and "write" task execute read() or write() 10,000 times to the virtual device file. "write" task execute write() in every 16msec. "Read" task issues next read() right after returns from read() execution. Measure the elapsed time between write() issues in "write" task and return of read() execution issued in "read" task. And also measure the elapsed time between the timing of write() command accepted in virtual device file and the timing of "read" task start. While measurement, execute some load tasks collaterally that execute 1us nanosleep repeatedly. Numbers of load tasks varies as 0, 1, 2, 4, 8, 16, 32. Load tasks were always execute as a non-realtime task. 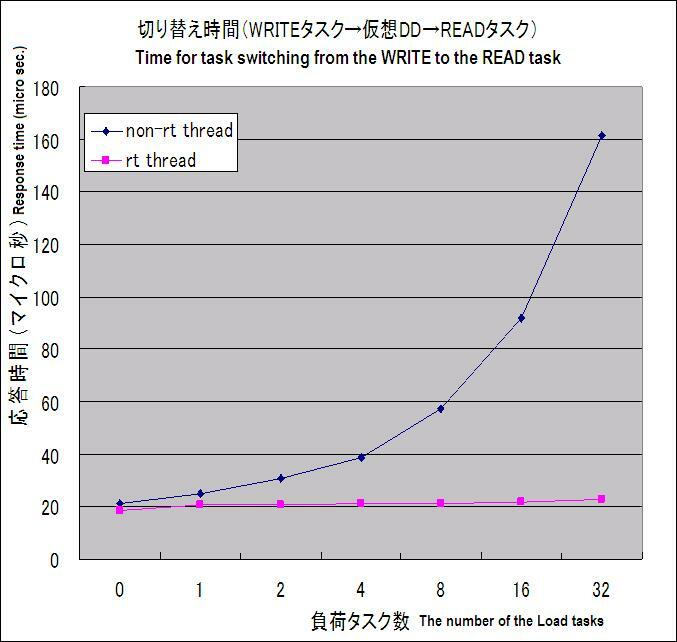 The elapsed time between write() issues in "write" task and return of read() execution issued in "read" task. The elapsed time between the timing of write() command accepted in virtual device file and the timing of "read" task start. Both thread takes longer time in 1st execution, than 2nd time or later. RT thread can achieve almost constant response time regardless of numbers of load tasks. Non-RT task's response time increase relative to load task number. Initial several response time of Non-RT task almost same as RT task, but after once it takes some long period, long period and short period repeated in every two times. 1st execution takes longer response time. Paging access to non-referenced space like library code (that is interrupt disabled period) blocks scheduler execution. Non-RT task response time is similar to that of RT task. 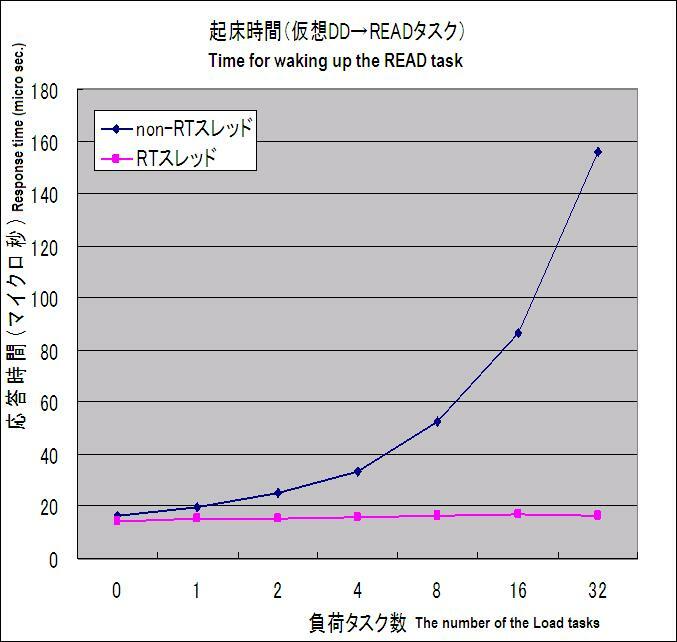 "Read" task blocked by read() gains higher priority than other load task(s). Then "read" task returns from read() assigned into higher priority queue and dispatched immediately rather than other load task(s) that has less seeped time. "Read" task returned from read() enter into the tail of queue list of other load task(s). So "read" task will dispatch after all other load task execution was done. Trace the dynamic priority transition of non-RT task. Measure the effect of kernel pre-emption period when using RT task. Adopt high-resolution timer count for measuring response time. Compare the test result of other architecture. Adopt realistic load task model. Measure thread wake up time from hardware interrupt event. This page was last edited on 12 May 2009, at 16:10.